Some people today, especially those of anti-Christian opinions, have the mistaken notion that the Bible prescribes permanent racial divisions among men and is, therefore, the cause of modern racial hatreds. As a matter of fact, the Bible says nothing whatever about race. Neither the word nor the concept of different “races” is found in the Bible at all. As far as one can learn from a study of Scripture, the writers of the Bible did not even know there were distinct races of men, in the sense of black and yellow and white races, or Caucasian and Mongol and Negroid races, or any other such divisions. The Biblical divisions among men are those of “tongues, families, nations, and lands” (Genesis 10:5,20,31) rather than races. The vision of the redeemed saints in heaven (Revelation 7:9) is one of “all nations, and kindreds, and people, and tongues”, but no mention is made of “races”. The formation of the original divisions, after the Flood, was based on different languages (Genesis 11:6-9), supernaturally imposed by God, but nothing is said about any other physical differences. Some have interpreted the Noahic prophecy concerning his three sons (Genesis 9:25-27) to refer to three races, Hamitic, Semitic and Japhetic, but such a meaning is in no way evident from the words of this passage. The prophecy applies to the descendants of Noah’s sons, and the various nations to be formed from them, but nothing is said about three races. Modern anthropologists and historians employ a much-different terminology than this simple trifurcation for what they consider to be the various races among men. Therefore, the origin of the concept of “race” must be sought elsewhere than in the Bible. If certain Christian writers have interpreted the Bible in a racist framework, the error is in the interpretation, not in the Bible itself. In the Bible, there is only one race—the human race! “(God) hath made of one, all nations of men” (Acts 17:26). In modern terminology, a race of men may involve quite a large number of individual national and language groups. It is, therefore, a much broader generic concept than any of the Biblical divisions. In the terminology of biological taxonomy, it is roughly the same as a “variety”, or a “sub-species”. Biologists, of course, use the term to apply to sub-species of animals, as well as men. For example, Charles Darwin selected as the subtitle for his book Origin of Species the phrase “The Preservation of Favoured Races in the Struggle for Life”. It is clear from the context that he had races of animals primarily in mind, but at the same time it is also clear, as we shall see, that he thought of races of men in the same way. As the 19th century scientists were converted to evolution, they were thus also convinced of racism. They were certain that the white race was superior to other races, and the reason for this superiority was to be found in Darwinian theory. The white race had advanced farther up the evolutionary ladder and, therefore, was destined either to eliminate the other races in the struggle for existence or else to have to assume the “white man’s burden” and to care for those inferior races that were incompetent to survive otherwise. In recent decades, the cause of racial liberation has made racism unpopular with intellectuals and only a few evolutionary scientists still openly espouse the idea of a long-term polyphyletic origin of the different races. On the other hand, in very recent years, the pendulum has swung, and now we have highly vocal advocates of “black power” and “red power” and “yellow power”, and these advocates are all doctrinaire evolutionists, who believe their own respective “races” are the fittest to survive in man’s continuing struggle for existence. 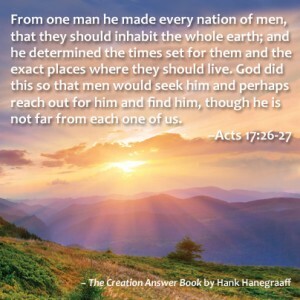 “(God) hath made of one blood, all nations of men for to dwell on all the face of the earth, and hath determined the times before appointed, and the bounds of their habitation: That they should seek the Lord, if haply they might feel after Him, and find Him” (Acts 17:26,27). No one nation is “better” than another, except in the sense of the blessings it has received from the Creator, perhaps in measure of its obedience to His Word and fulfillment of its calling. Such blessings are not an occasion for pride, but for gratitude. The cosmological argument attempts to prove God’s existence by observing the world around us (the cosmos). It begins with what is most obvious in reality: things exist. It is then argued that the cause of those things’ existence had to be a “God-type” thing. These types of arguments go all the way back to Plato and have been used by notable philosophers and theologians ever since. Science finally caught up with theologians in the 20th century, when it was confirmed that the universe must have had a beginning. So, today, the cosmological arguments are even powerful for non-philosophers. There are two basic forms of these arguments, and the easiest way to think of them might be the “vertical” and the “horizontal.” These names indicate the direction from which the causes come. In the vertical form, it is argued that every created thing is being caused right now (imagine a timeline with an arrow pointing up from the universe to God). The horizontal version shows that creation had to have a cause in the beginning (imagine that same timeline only with an arrow pointing backward to a beginning point in time). The horizontal is a little easier to understand because it does not require much philosophizing. The basic argument is that all things that have beginnings had to have causes. The universe had a beginning; therefore, the universe had a cause. That cause, being outside the whole universe, is God. Someone might say that some things are caused by other things, but this does not solve the problem. This is because those other things had to have causes, too, and this cannot go on forever. Let’s take a simple example: trees. All trees began to exist at some point (for they have not always existed). Each tree had its beginning in a seed (the “cause” of the tree). But every seed had its beginning (“cause”) in another tree. There cannot be an infinite series of tree-seed-tree-seed, because no series is infinite—it cannot go on forever. All series are finite (limited) by definition. There is no such thing as an infinite number, because even the number series is limited (although you can always add one more, you are always at a finite number). If there is an end, it is not infinite. All series have two endings, actually—at the end and at the beginning (try to imagine a one-ended stick!). But if there were no first cause, the chain of causes never would have started. Therefore, there is, at the beginning at least, a first cause—one that had no beginning. This first cause is God. The vertical form is a bit more difficult to understand, but it is more powerful because not only does it show that God had to cause the “chain of causes” in the beginning, He must still be causing things to exist right now. Again, we begin by noting that things exist. Next, while we often tend to think of existence as a property that things sort of “own”—that once something is created, existence is just part of what it is—this is not the case. Consider the triangle. We can define the nature of a triangle as “the plane figure formed by connecting three points not in a straight line by straight line segments.” Notice what is not part of this definition: existence. This definition of a triangle would hold true even if no triangles existed at all. Therefore, a triangle’s nature—what it is—does not guarantee that one exists (like unicorns—we know what they are, but that does not make them exist). Because it is not part of a triangle’s nature to exist, triangles must be made to exist by something else that already exists (someone must draw one on a piece of paper). The triangle is caused by something else—which also must have a cause. This cannot go on forever (no infinite series). Therefore, something that does not need to be given existence must exist to give everything else existence. Now, apply this example to everything in the universe. Does any of it exist on its own? No. So, not only did the universe have to have a first cause to get started; it needs something to give it existence right now. The only thing that would not have to be given existence is a thing that exists as its very nature. It is existence. This something would always exist, have no cause, have no beginning, have no limit, be outside of time, and be infinite. That something is God! 5. Therefore, the explanation of the universe’s existence is God. Now this is a logically airtight argument. So if the atheist wants to deny the conclusion, he has to say that one of the three premises is false. But which one will he reject? Premise 3 is undeniable for any sincere seeker after truth. So the atheist is going to have to deny either 1 or 2 if he wants to remain an atheist and be rational. So the whole question comes down to this: are premises 1 and 2 true, or are they false? Well, let’s look at them. According to premise 1 there are two kinds of things: (a) things which exist necessarily and (b) things which exist contingently. Things which exist necessarily exist by a necessity of their own nature. Many mathematicians think that numbers, sets, and other mathematical entities exist in this way. They’re not caused to exist by something else; they just exist by the necessity of their own nature. By contrast, contingent things are caused to exist by something else. They exist because something else has produced them. Familiar physical objects like people, planets, and galaxies belong in this category. So what reason might be offered for thinking that premise 1 is true? Well, when you reflect on it, premise 1 has a sort of self-evidence about it. Imagine that you’re hiking through the woods one day and you come across a translucent ball lying on the forest floor. You would naturally wonder how it came to be there. If one of your hiking partners said to you, “It just exists inexplicably. Don’t worry about it!”, you’d either think that he was crazy or figure that he just wanted you to keep moving. No one would take seriously the suggestion that the ball existed there with literally no explanation. Now suppose you increase the size of the ball in this story so that it’s the size of a car. That wouldn’t do anything to satisfy or remove the demand for an explanation. Suppose it were the size of a house. Same problem. Suppose it were the size of a continent or a planet. Same problem. Suppose it were the size of the entire universe. Same problem. Merely increasing the size of the ball does nothing to affect the need of an explanation. Premise 1 is the premise that the atheist typically rejects. Sometimes atheists will respond to premise 1 by saying that it is true of everything in the universe but not of the universe itself. But this response commits what has been aptly called “the taxicab fallacy.” For as the nineteenth century atheist philosopher Arthur Schopenhauer quipped, premise 1 can’t be dismissed like a hack once you’ve arrived at your desired destination! It would be arbitrary for the atheist to claim that the universe is the exception to the rule. The illustration of the ball in the woods showed that merely increasing the size of the object to be explained, even until it becomes the universe itself, does nothing to remove the need for some explanation of its existence. Notice, too, how unscientific this atheist response is. For modern cosmology is devoted to the search for an explanation of the universe’s existence. The atheist attitude would cripple science. This line of reasoning is obviously fallacious. For it assumes that the universe is all there is, so that if there were no universe there would be nothing. 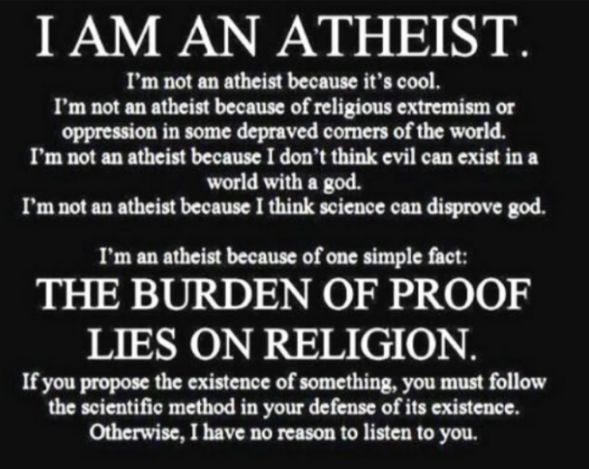 In other words, the objection assumes that atheism is true! The atheist is thus begging the question, arguing in a circle. I agree that the explanation of the universe must be a prior state of affairs in which the universe did not exist. But I contend that that state of affairs is God and His will, not nothingness. So it seems to me that premise 1 is more plausibly true than false, which is all we need for a good argument. What, then, about premise 2? Is it more plausibly true than false? So you can’t affirm (A) and deny (B). But (B) is virtually synonymous with premise 2! So by saying in response to premise 1 that, given atheism, the universe has no explanation, the atheist is implicitly admitting premise 2, that if the universe does have an explanation, then God exists. Besides that, premise 2 is very plausible in its own right. For think of what the universe is: all of space-time reality, including all matter and energy. It follows that if the universe has a cause of its existence, that cause must be a non-physical, immaterial being beyond space and time. Now there are only two sorts of thing that could fit that description: either an abstract object like a number or else an unembodied mind. But abstract objects can’t cause anything. That’s part of what it means to be abstract. The number 7, for example, can’t cause any effects. So the cause of the existence of the universe must be a transcendent Mind, which is what believers understand God to be. The argument thus proves the existence of a necessary, uncaused, timeless, spaceless, immaterial, personal Creator of the universe. This is truly mind-blowing! The atheist has one alternative open to him at this point. He can retrace his steps, withdraw his objection to premise 1, and say instead that, yes, the universe does have an explanation of its existence. But that explanation is: the universe exists by a necessity of its own nature. For the atheist, the universe could serve as a sort of God-substitute which exists necessarily. Now this would be a very radical step for the atheist to take, and I can’t think of any contemporary atheist who has in fact adopted this line. A few years ago at a Philosophy of Time conference at City College in Santa Barbara, it seemed to me that Professor Adolf Grünbaum, a vociferous atheistic philosopher of science from the University of Pittsburgh, was flirting with this idea. But when I raised the question from the floor whether he thought the universe existed necessarily, he was quite indignant at the suggestion. “Of course not!” he snapped and went on to say that the universe just exists without any explanation. The reason atheists are not eager to embrace this alternative is clear. As we look about the universe, none of the things that make it up, whether stars, planets, galaxies, dust, radiation, or what have you, seems to exist necessarily. They could all fail to exist; indeed, at some point in the past, when the universe was very dense, none of them did exist. But, you might say, what about the matter out of which these things are made? Maybe the matter exists necessarily, and all these things are just different contingent configurations of matter. The problem with this suggestion is that, according to the standard model of subatomic physics, matter itself is composed of tiny particles called “quarks.” The universe is just the collection of all these quarks arranged in different ways. But now the question arises: couldn’t a different collection of quarks have existed instead of this one? Does each and every one of these quarks exist necessarily? Now it seems obvious that a different collection of quarks could have existed instead of the collection that does exist. But if that were the case, then a different universe would have existed. To see the point, think about your desk. Could your desk have been made of ice? Notice that I’m not asking if you could have had an ice desk in the place of your wooden desk that had the same size and structure. Rather I’m asking if your very desk, the one made of wood, if that desk could have been made of ice. The answer is obviously, no. The ice desk would be a different desk, not the same desk. Similarly, a universe made up of different quarks, even if identically arranged as in this universe, would be a different universe. It follows, then, that the universe does not exist by a necessity of its own nature. So atheists have not been so bold as to deny premise 2 and say that the universe exists necessarily. Premise 2 also seems to be plausibly true. But given the truth of the three premises the conclusion is logically inescapable: God is the explanation of the existence of the universe. Moreover, the argument implies that God is an uncaused, unembodied Mind who transcends the physical universe and even space and time themselves and who exists necessarily. What a great argument! There is currently a lot of debate over the validity of creationism, defined as “the belief that the universe and living organisms originate from specific acts of divine creation, as in the biblical account, rather than by natural processes such as evolution.” Creation science is often dismissed by the secular community and accused of lacking scientific value. However, creationism is clearly compatible with a scientific approach to any topic. Creationism makes statements about real world events, places, and things. It is not concerned solely with subjective ideas or abstract concepts. There are established scientific facts that are consistent with creationism, and the way in which those facts relate to one another lends itself to a creationist interpretation. Just as other broad scientific ideas are used to lend coherence to a series of facts, so, too, does creationism. A key factor in the debate is that the majority of scientists who believe in evolution are also atheists or agnostics. There are some who hold to some form of theistic evolution and others who take a deistic view of God (God exists but is not involved in the world, and everything proceeds along a natural course). There are some who genuinely and honestly look at the data and arrive at the conclusion that evolution better fits with the data. However, these represent an insignificant percentage of the scientists who advocate evolution. The vast majority of evolutionary scientists hold that life evolved entirely without any intervention of a higher being. Evolution is by definition a naturalistic science. For atheism to be true, there must be an alternate explanation—other than a Creator—for how the universe and life came into existence. Although belief in some form of evolution predated Charles Darwin, he was the first to develop a plausible model for the process of evolution—natural selection. Darwin once identified himself as a Christian but as a result of some tragedies that took place in his life, he later renounced the Christian faith and the existence of God. Evolution was invented by an atheist. Darwin’s goal was not to disprove God’s existence, but that is one of the end results of the theory of evolution. Evolution is an enabler of atheism. Evolutionary scientists likely would not admit that their goal is to give an alternate explanation of the origins of life, and thereby to give a foundation for atheism, but according to the Bible, that is exactly why the theory of evolution exists. If creation is true, then there is a Creator to whom we are accountable. Evolution is an enabler for atheism. Evolution gives atheists a basis for explaining how life exists apart from a Creator God. Evolution denies the need for a God to be involved in the universe. Evolution is the “creation theory” for the religion of atheism. According to the Bible, the choice is clear. We can believe the Word of our omnipotent and omniscient God, or we can believe the illogically biased, “scientific” explanations of fools.